Mark is one of the most positive individuals I have met in triathlon. Mark has the ability to connect with athletes and inspire them to be a better person and athlete. He helps make the world a better place. Mark is one of the nicest, most caring people and coaches I have ever met. He really listens to your needs as a person and as an athlete. I couldn’t speak higher of his knowledge and thoughtfulness. A true gem! After getting to know Mark through local area races over the past few years, I started working with Mark as my coach. Mark helped me prepare for a summer of racing sprints and a Half Iron-distance race while coming back from a terrible hamstring injury. Through workouts customized to my physical abilities and work life and through teaching me better running form, I was able to race this summer when it did not look possible to me at the beginning of the year. The workouts he gave me were challenging and I saw improvements in all three sports, but especially in biking. Mark’s positive and generous nature is outstanding. And I look forward to working with him for years to come. “Having DNF’d my first full IM in 2015, I sought out coaching for my redemption race in 2016. My husband and I met Mark at a HITS event where he was the Race Director and were impressed with his genuine and caring nature towards athletes. We had interviewed other coaches who seemed more interested in telling us about how awesome THEY were than what they could offer us. Mark was more interested in us and our goals so we knew he was the coach for us. My prior training was based on heart rate, which really didn’t do much to remedy the problem with my weakest discipline – the bike. I was historically a runner and relatively new to cycling and simply was not fast enough. We were initially seeking advice from Mark regarding the current training curriculum, however, Mark gave us something completely new and different to us. We took a leap of faith and trusted his expertise. It paid off! In March of 2016, my husband and I did IM Monterrey 70.3 as a training race in preparation for the full IM in May. I was strong on the bike and much faster; setting me up for a great run. Not only did I cut a whole hour off my last 70.3 time but I qualified for 70.3 IM Championships…and so did my husband! Celebrations had to wait as I still had my full IM to contend with. My goal when I started with Mark was a hopeful 15-hour race. I went into the race completely confident because of some of the long training bricks he had me do. It was great prep for the race. The race went really well. I gained 26 spots on the bike and managed to finish the race almost an hour better than I had hoped. “I first met Coach Mark Wilson at HITS Havasu five years ago. He was the RD, I was a budding AG participant, shooting for my second 70.3. Mark embodies the sport of Triathlon with his soul! He seriously ‘touched’ something deep inside of me that day, something that changed my life. He made me feel I could do anything and his pre race prayer before the swim wrapped me in a ‘spiritual safety blanket’.I allowed myself to take in every minute of that race, not simply as a competition but as a journey in my life. What I discovered was my own LOVE for the sport and the desire to learn from Mark. My husband and I followed Mark to many more races. I asked him to coach me and learned to know him not only as a great RD but a remarkable person, athlete and coach. His weekly triathlon camp intrigued me and with great anticipation I signed up and touched down in Kona for his January 2016 camp. Paradise is a beautiful place to Tri! I had the chance to visit Kona just a few months before for the IM World Championship and couldn’t believe that I was swimming, riding and running at the Holy Grail! Mark evaluated and provided video analysis for us, the six Kona campers! He was able to address our strengths and weaknesses individually but in a group session that was fun and non threatening nor intimidating. Every day we had the opportunity to swim in the ocean, once super close to a pod of spinner Dolphins. Mark eased those of us who had anxiety about the ‘critters’ beneath! Mind games are a deal breaker but all of us went further than we had imagined. Swimming is my favorite leg, though I had not done any ocean swims before this camp. We rode on the Queen K Highway out to Waikaloa twice and the ‘spiritual energy’ of the course charged my desire and will to do better and more. Running in paradise is challenging; the humidity is a game changer, especially since I’m a desert rat from Vegas. After three daily ‘physical sessions’ we met for ‘class room sessions’ and reviewed our progress. We talked and learned about body mechanics, nutrition, gear, mental strategies and race day tips. “When I met Mark nearly 5 years ago to discuss coaching I was impressed with his caring and focused approach. We discussed my goals and he immediately started me on a long term plan that turned me into a competitive athlete. Mark has committed himself to his own development as a coach and I have truly benefited from his learning. He guided me from my first IM finish 2 years ago in 13:14 to an IM PR of 11:59 this year. Mark’s training program is extremely efficient, maximizing time by emphasizing skill development along with strength and endurance. I’ve become consistently stronger and faster while avoiding injury, and have done so while maintaining a training load that allows me to live a full life. During Ironman buildup this year he balanced distance training and speed development without my once experiencing symptoms of overtraining. At the same time I placed well in several sprint triathlons. “My name is Trudy A. from Inverness, FL. and I’ve been telling everyone about my experience so far with my new Life Coach, Mark Wilson. With his expertise and knowledge of health and wellness I’ve lost 10lbs. in 3 1/2 weeks and I feel better and more energetic than I have in a long time. I’m 67 years old and I’ve always had trouble losing weight. I love my Skype conference with him every week, he’s so encouraging and always has great ideas for any questions I may have. I know with Coach Mark on my side I can’t fail this time. I have attended 3 of Mark’s Tri Camps. Two weekend ones and a full week camp. Both were EXCELLENT…. Like training w/ an Olympian. “I first met Mark Wilson at a HITS triathlon training camp that he presented in May 2014 at Diamond Mills in NY. At this camp Mark introduced me to new techniques to improve all three of my splits. He focused on simplicity and effectiveness. I don’t have a lot of time to train and he worked his training plans around this limitation. I currently focus on Sprints. I thoroughly enjoyed the week and left with a tailored plan ready to see what it would do. I was cautiously optimistic as it was quiet a change to what I had been doing, but I was excited! The plan essentially requires less time in the pool, but focuses on an approach that requires good form and strength to be successful. The drills don’t work unless you develop these characteristics. I don’t want to go into detail here as it really requires Mark’s explanation to be properly understood and applied. Suffice to say that in some 5 months I have improved my swim splits by about 10%. Although I am still not as fast as I would like to be (who is! )..the methodology is paying off..and requiring less time while providing steady improvement. This has allowed me to spend more time on my bike and run which are my strengths. Over the same period of time I have also increased my power output on my bike by at least 10% and my running splits by more than. 5%. So what has this done for my races? 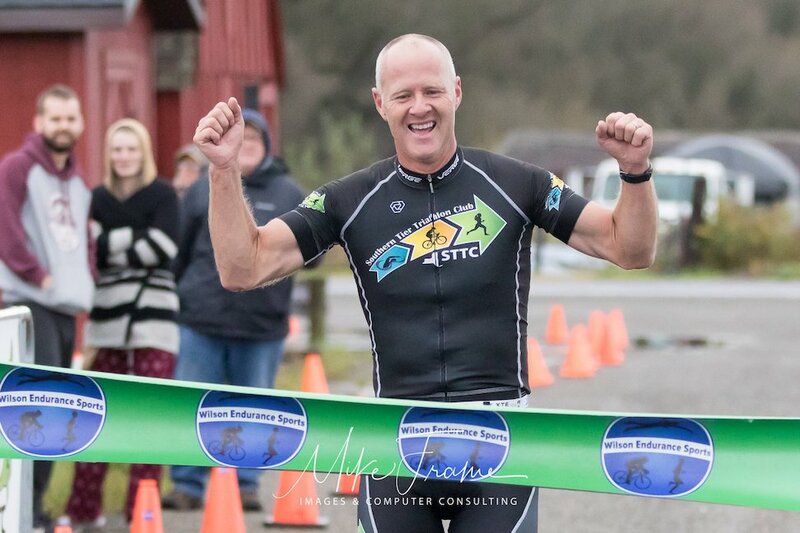 I won my AG Duathlon back a few weeks ago (40-44) and last week placed 4th in my AG in a local tri. Narrowly missing 3rd spot by 7 seconds predominantly due to a T2 transition blunder, but all three splits were PR’s! This is a race that I did last year and placed 11th. The good news is that these improvements continue, and at my age this is unusual. Again this is only after app. 5 months of following Mark’s plan and coaching guidance. Although I live in Texas and Mark in NY, our weekly coaching phone sessions are effective. In 30 minutes we review the previous weeks training outcomes, discuss the plan for the following week and develop strategy for any races coming up if required. Mark also good at realizing when rest is required based on this feedback. He prescribes recovery weeks accordingly to build on progress and reduce risk of overtraining. “My week of Tri camp came to its finale today with our mock Sprint. I applied everything I’ve learned this week to my race. I’m blown away as to how much it was possible to improve in 4 days. In a nutshell, we overswam the distance. When I calculated my overall race time 1:40 minus the extra swim and transitions it looks like I could shoot for a time of 1:35 – 1:39 next Sunday which means I could be a contender for the podium. We shall see…….. I came first out of the water today after maintaining a 30 second faster pace per 100yd since yesterday. I keep myself calm by reciting in my head a Sanskrit mantra dedicated to Ganesha (the remover of obstacles) and boy do I know that panic and anxiety can be quite the obstacles especially when out in vast dark waters. Fear has been overcome. Wow! I shaved a full 4 minutes off of a steepsteep climb by being cognizant of my heart rate. Apparently when my HR goes above 150, my lungs blow up and I can’t breathe. Just by keeping my heart rate down, I was better able to control my legs, didn’t experience lactic burn or lung collapse and went faster up that hill! Double Wow. I will never forget sitting down with Mark one evening for dinner to discuss his coaching philosophy. I was impressed with his questions and focused approach. We discussed my training and race history as well as my previous athletic endeavors all the way back to high school; this included discussion on my goals for the sport triathlon. into a more competitive triathlete. We stopped playing around with the long races and focused on the Sprint/Olympic distances and suddenly I was no longer 4th, 5th or 6th in my age group but reaching the podium. The training program he designed for me was efficient and challenging. He maximized my time by emphasizing my stronger skills in the swim and bike, all the while developing my weaker run. Oh, and did I mention that with Mark’s guidance I can now claim I am an ITU Sprint World Championship Finisher (Beijing, China 2011)?! Time for the next step in my personal evolution in the sport of triathlon and a new coaching challenge for Mark; nine tri-camps later…yes, I have attended 9 of Mark’s camps since that first one…and celebrated 4 birthdays at the tri-camp in Lake Placid learning something new every time. Moving forward, I will attend tri-camps as a coach in training; to beg, borrow and steal from him. A step I would never have taken without his encouragement, advice and willingness to share his expertise with me. 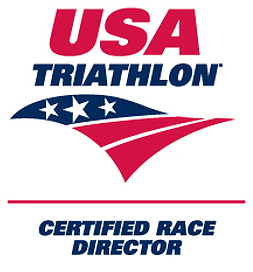 With Mark’s guidance, I have moved from triathlete to Triathlete Coach. “What can I say about my coach, Mark Wilson? So much. He is probably the most compassionate, caring but tough coach you’ll ever have the honor to be coached by. Although he has many clients, he makes you feel like you’re the only one he’s even training. He’ll push you to limits that you didn’t even know you could get to and make you the athlete you never thought you could be. He has all the knowledge to shape your body into the body you’ve always wanted, it’s just up to you to actually do it! I started out my fitness journey probably about a year ago. When I first started, I looked at it as a chore, as some time consuming activity I had to do 5 days a week & I honestly hated it. So I fluctuated on and off for a few months. I lost a couple pounds here and there but nothing like I wanted. It wasn’t until a few months ago that I really started doing it religiously, week after week with no excuses. But that too lasted about 2 months & I got in a slump again. I stopped moving and just ate whatever I wanted and I felt so awful. I felt sluggish, tired and self conscious. I even stopped my weekly Skype sessions with Mark. In that time, he never got upset with me, he never made me feel bad for it but instead he just waited. He let me start again when I was ready, when I realized I needed to. And when I did, he didn’t make me feel bad for stopping but instead just picked up where we left off and got right back on the horse again. What he made me realize is that even though I’m training for this half marathon in November, this isn’t just a diet or a training plan to stop when the race is over but instead, this is a LIFE STYLE change. Making things realistic that you can stick to for the rest of your life. Once I realized this, I no longer look at exercising as a chore. I make time to go to the gym, to run; not because I have to but because I want to, because I know that I’m keeping my body healthy and getting into the best shape that I can be in; it’s all thanks to my coach. He never gave up on me when I wanted to give up myself. When I started this life style change, I was 189lbs (the heaviest I’ve ever been) and now I’m down to 168lbs, the lightest I’ve been since I was probably 13 years old, which is saying a lot considering that I’m currently 21. Mark and I met at my first triathlon which happened to be his event. One of my tri sisters raved about Marks coaching and here we are. Coach had his work cut out for him when he took me on as an athlete! The last decade has been full of injuries, poor training, and lasting effects of the female athlete triad. In just 7 months time, Mark has safely built me back up physically, emotionally, and mentally. This past fall he coached me through a few triathlons and a duathlon. Yesterday, I ran a 9 minute PR in my half marathon (haven’t been able to run a half in over 3 years). All of this would not have been possible without the guidance and expertise of Mark. He customizes workouts to fit your needs and schedule. Mark is understanding, compassionate, motivational, and has this positive contagious energy. Our journey has just begun – I can’t wait to see where training and racing goes from here.